With the mainstreaming of Natural, the industry remains one of high innovation by necessity, with many in-market trends laddering up to dominant macro forces that are covered in this report. This insider’s guide can help you get on trend and stay there and help you create products that promote health, sustainability, and a better world. It will help bridge the gap between aspiration and execution. Get the latest insider’s guide to where the natural products market is now—and where it’s headed. Drawing from proprietary data sets, expert interviews, in-market case studies, and the Natural Products Expos, the NEXT Forecast is the industry’s leading source of forward-looking insights. The “Insider Insights” you need to succeed in Natural! Including Market Overview and all three Cultural Shifts (Cultural Awakening, Moden Life, Tech Enablers) as well as Design Trends. Includes 2016 Forecast for Foods & Beverages; Macro Forces chapter; NEXT Trend Ingredients, Certifications, and Claims chapter; and Design Trends chapter. Includes 2016 Forecast for Supplements; Macro Forces chapter; NEXT Trend Ingredients, Certifications, and Claims chapter; and Design Trends chapter. 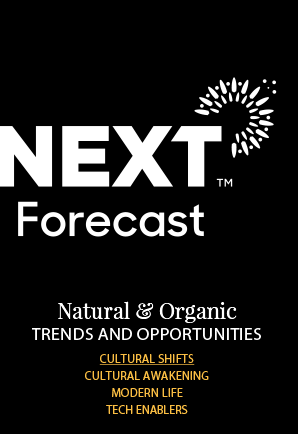 Includes 2016 Forecast for Natural Living (beauty, household, and pet); Macro Forces chapter; NEXT Trend Ingredients, Certifications, and Claims chapter; and Design Trends chapter. For more information about Corporate Subscriptions, contact Mark Mallardi at mmallardi@newhope.com.